We have all seen it; it cannot be missed as we zoom south on I-25. 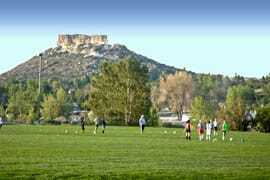 The huge castle-shaped butte that welcomes us to the town named after it, Castle Rock. If you are looking for a fun outing right here in your own backyard, spend a couple of hours at Rock Park. Pack some snacks, grab the dog, and put the kids in the car. In less than ten minutes you will arrive at a great 1.4 mile trail around and up the historic landmark. The parking lot is just north of downtown Castle Rock, on the east side of Front Street. The park is open from sunrise to sunset all year. There is a picnic pavilion at the base of the butte. Rock Park is overseen by the town's Parks and Recreation Department. Its trail is native surface (gravel and rock), and climbs only 370 feet. From the top, there are outstanding views of Pike's Peak and the Front Range, downtown Castle Rock, and the I-25 corridor. Walk around Rock Park five times to say you hiked a 14er! Castle Rock towers over the town named after it. Access Rock Park from Front Street, just north of downtown Castle Rock. Castle Rock is seen from all around town. Here, girls practice soccer at the Douglas County Fairgrounds.